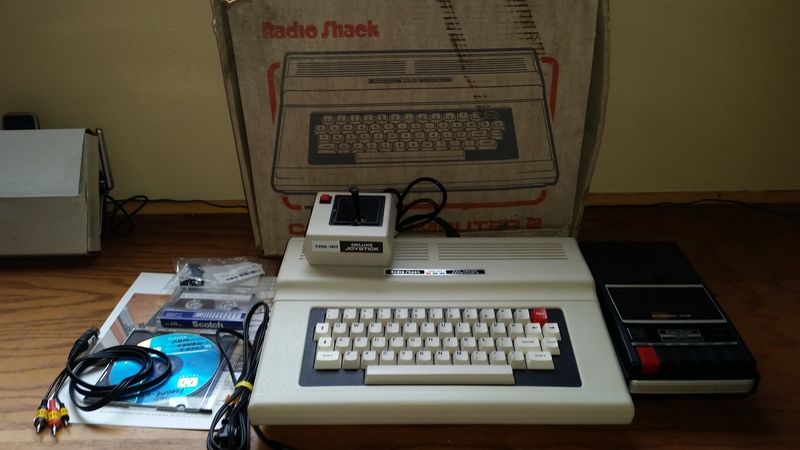 I have a fantastic, refurbished Radio Shack (Tandy) TRS-80 Color Computer 2 64K up for grabs on eBay right now, with its original box! This one has a bunch of extras and some stuff I have made myself. Check out my Auctions page for more details! I rescued this piece, amongst others, from an Estate sale. It has been cleaned, tested and works great! I also re-worked the casing of the computer and joystick in order to restore them to their former glory! The box has seen better days (see pictures). However, it is original! I have also included a CD with software in WAV file format, containing the software on the cassette. I also supply printed instructions on how to set up the Radio Shack TRS-80 64K Color Computer 2 so that you can load these files into the Color Computer from your smart phone! The CoCo 2, introduced in 1983, is basically a refinement of Radio Shack’s original TRS-80 Color Computer. It utilizes a more efficient power supply, higher integration (lower parts count), and a smaller case. The only significant functional difference between the two is the absence in the CoCo 2 of a regulated +12VDC power supply. The 26-3127 model is the first 64K Color Computer 2. 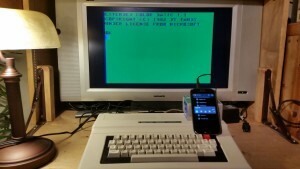 It contains the Extended BASIC ROM, the enhanced keyboard, and 64 kilobytes of RAM (naturally). Otherwise, it is identical to the 26-3026/26-3027. Note that the RAM is soldered in place in those machines which were factory-equipped with 64K. 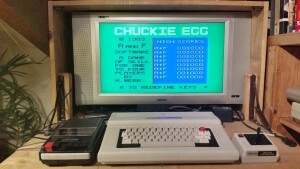 Vintage Commodore 64 System IOB! 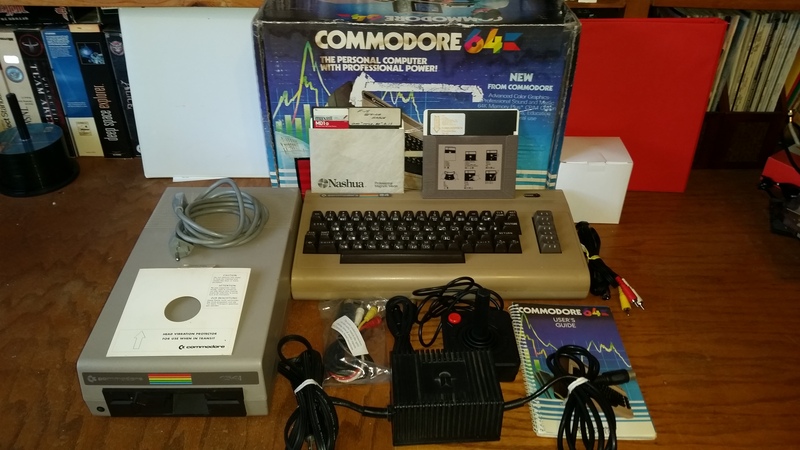 I have put up for auction an original complete Commodore 64 Computer system in excellent working condition! 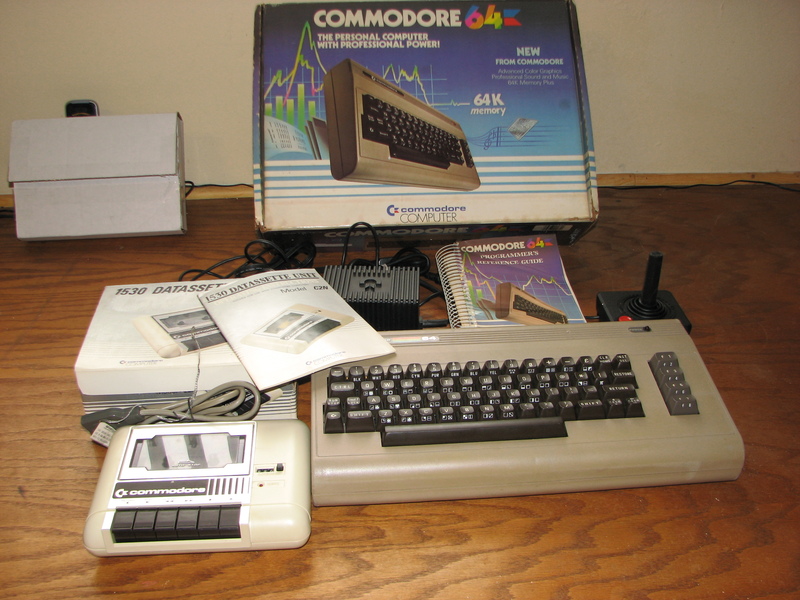 The Commodore 64 itself comes with its original box! It went up for auction at 9PM Eastern Standard Time, 6PM Pacific on Sunday, 22nd November, 2015! Keep checking my Auction Page for details! Take a walk into Retro-land with this fantastic piece of history! I have put together this system from various sources and have used it for quite a while now. On closer inspection of the photographs, you will note that there is signs of discoloration and some small cosmetic defects and scuffs through age. All in all, not bad at all for a system that is over 30 years old! 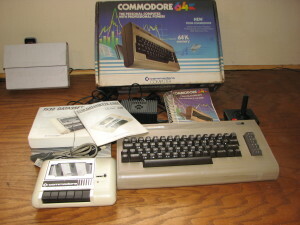 This Commodore 64 comes with an 8-pin DIN socket for connecting to a TV/Monitor. I have supplied a compatible 5-pin DIN phono cable (TV only) and an 8-pin DIN MONITOR ONLY cable (if you have a compatible Commodore monitor). The keyboard works very well ( no standing on the keys to get it to type… ). 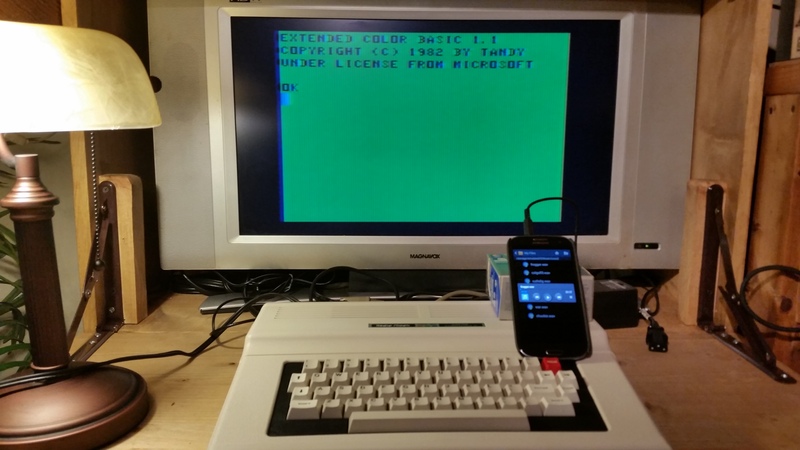 The Commodore C2N Datasette has been tested and works. 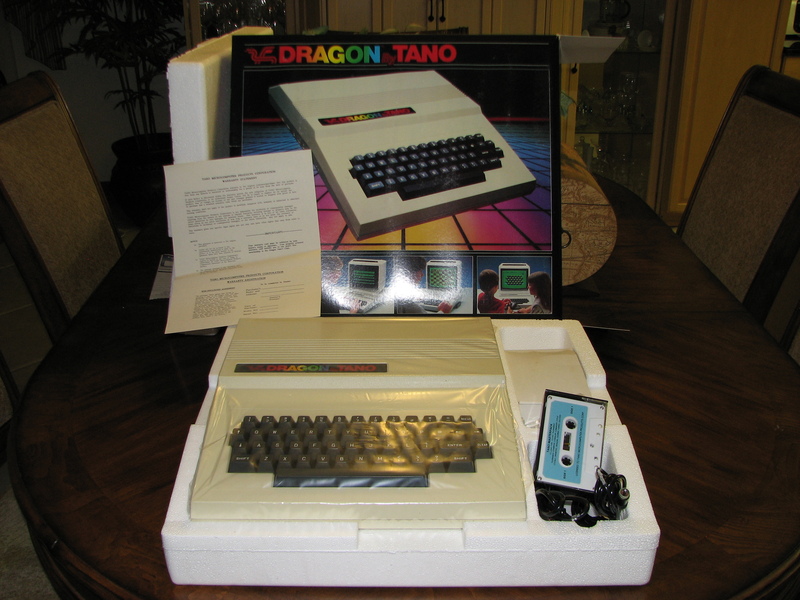 It comes in its original box, complete with manual! The Atari 2600 joystick is new old stock, coming in its original box. 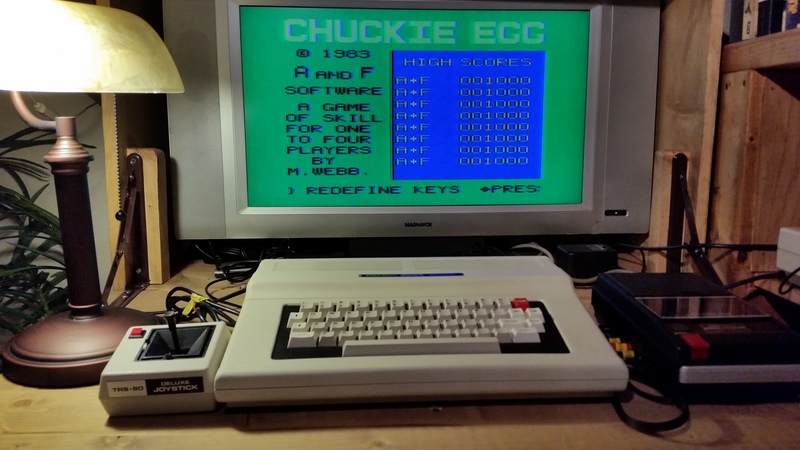 It is fully compatible with the Commodore 64. I am also throwing in a complete programmers reference guide that I bought separately and a serial cable if you wish to get a 1541/1571 floppy drive. For alternative forms of storage I HIGHLY RECOMMEND the SD2IEC drive emulator, which uses a modern day SD card for storage! Also, there is a bunch of public domain software for the Commodore 64! Tandy Radio Shack CoCo 2 Goodness! Right now I have two auctions up on eBay for one of the classics of the home computer era! A Radio Shack 64K Color Computer 2 and a 16K version! (see my Auctions page for more details). I have lovingly restored these machines to their former glory and they look kinda like new if I say so myself. Awesome considering the are over 32 years old, and still in great working condition! I even made up a cable that will allow you to load programs to the computers via your smart phone! Again, see the auctions for details! As the holiday season draws closer, I hope to furnish people with a genuine retro experience with these legendary machines. I’m sure any retro-head out there would be proud to add these little beauties to their collection! It will be up for auction at 9PM Eastern Standard Time, 6PM Pacific on Sunday, 8th November, 2015! 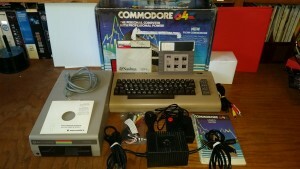 Commodore 64 Full System bonanza auction! A must have for the budding retro enthusiast, collectors or just because you can for the holiday season! On closer inspection of the photographs, you will note that there is slight signs of discoloration and some very small cosmetic defects through age. I have also replaced the rubber feet on the Commodore 64. 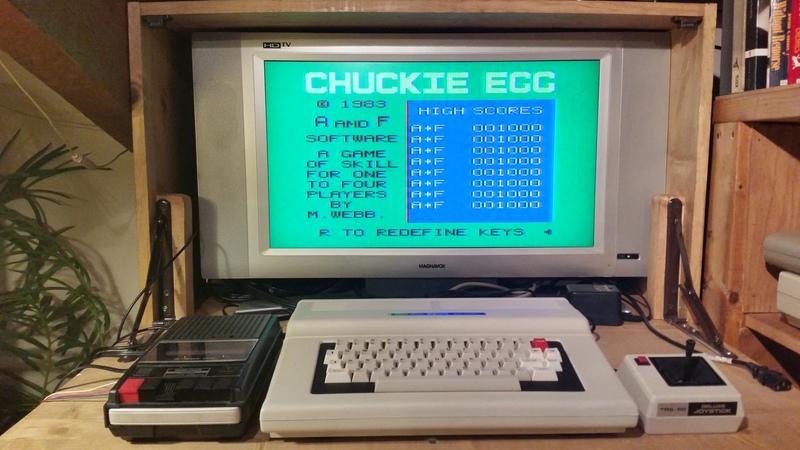 The Commodore 1541 Floppy Drive has been tested and works. Some of the cables are almost brand new. A floppy disk containing the game “F-15 Strike Eagle”!